If you’ve been on the Internet long enough chances are you’ve seen a feel-good story about a puppy who uses wheels instead of back legs or a cat that was born with no nose but is still so adorably lovable. September 13th is Pet Birth Defect Awareness Day and we wanted to share some of our favorite inspirations who aren’t letting their imperfections slow them down… like, at all. Daisy Underbite (@underbiteunite) – With 227,000 Instagram followers it’s no wonder Daisy keeps smiling! With no use of her front legs and a protruding mandible, this adorable mixed breed shows that different is still adorable. Oskar the Blind Cat. This little fella was born with microphthalmia, meaning his eyeballs didn’t fully develop, but he still pounces, plays, and lays like a regular cat with his brother Klaus on their YouTube channel. 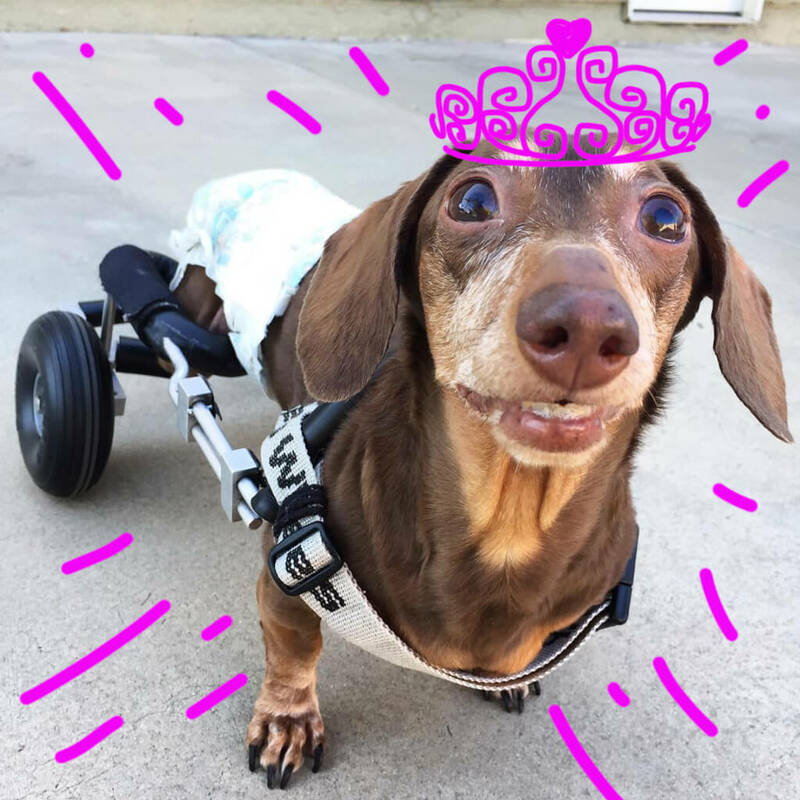 Princess Lilo (@prinss_lilo_weenie) – This paralyzed Dachshund shows her 79,000 IG followers that Intervertebral Disk Disease (IVDD) doesn’t mean the good times can’t keep rolling. Faith the dog was born without front legs and learned how to walk upright like a human. Though she passed in 2014, she was a spokesdog for overcoming adversity, especially for injured veterans, and even named one of Oprah’s favorite animals. Anakin the Cat (@anakintwolegs) – Born without a pelvis or back legs, Anakin the biped can still run, use his litter box, and climb his cat tree like everyone else. You can watch how this little inspiration does it on his YouTube channel. Do you own a pet with a handicap or birth defect? We want to meet and hear all about them! Post their picture and bio on Instagram and mention @petsaddlife or #petsaddlife.